LONG BEACH— Alamitos Bay Yacht Club (ABYC) Commodore Chuck Clay won this year’s Cal 20 Fun Run, the end-of-season regatta hosted by Long Beach Yacht Club (LBYC), on Dec. 10. LBYC staff commodore Mike Van Dyke finished two points behind Clay for second place and five-time winner Keith Ives, ABYC, ended the day’s racing with third place overall. On a cool and overcast day, the forecasted wind of 7 to 9 knots never showed and the fluky 3 to 4 knots of breeze couldn’t make up its mind which direction it wanted to come from. Pro Doug Bower made the mark set team earn their stripes today, frequently adjusting the course setup in an effort to keep up with the breeze. This traditional regatta, held on the first or second weekend of December, puts the emphasis on fun with joking and well wishes heard from boat to boat. It’s a good old fashioned day of racing with friends and family. The five dollar entry fee is handed to the race committee boat on the water, and trophies are given to the top finishers before they make their way back to the dock for the day. 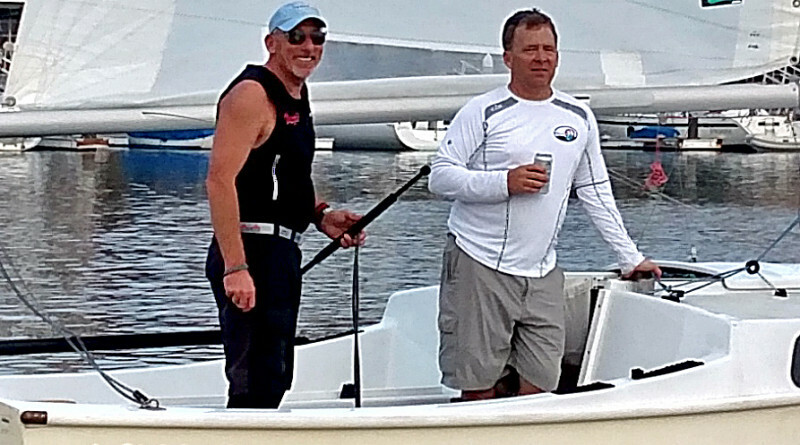 There are no skippers meetings; no formalities; just a fun time for all.